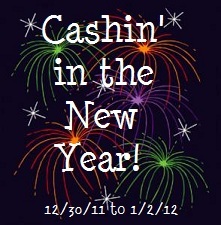 Hostessed by Home Grown Families and Mama to 4 Blessings with my help &several other fantastic we bring you Cashin' in the New Year! This giveaway runs from 12:01 AM on Friday 12/30 and will run until Monday, 1/2 at 11:59 PM (all Eastern times). One winner will receive $190 Cash into their paypal!